Fuel cell vehicles need hydrogen to operate, but that hydrogen has to be free of any contaminants that could damage the fuel cell. Professor Andreas Schütze and his research team at Saarland University are collaborating with research partners to develop a sensor system that can provide continuous in situ monitoring of hydrogen quality at hydrogen fuelling stations. The infrared measuring cell will be installed inside the hydrogen filling station and will have to operate under very challenging conditions. The sensor system has to work reliably, despite extremely high pressures and short refueling times. The new sensor system will be undergoing operational trials this autumn. The research team from Saarbrücken will be at this year's Hannover Messe starting 1 April, where they will be showcasing their high-pressure test rig at the Saarland Research and Innovation Stand (Hall 2, Stand B46). Cars don't like it if they are forced to run on low-quality or low-purity fuels. And the same is true of vehicles powered by fuel cell technology. The driver of a fuel cell vehicle fills up with hydrogen rather than a fossil-based fuel, but even hydrogen can be contaminated. Impurities such as sulfur-containing compounds, ammonia or hydrocarbons can all contaminate the hydrogen during the production process, during transportation to the hydrogen station or during the refilling process. And that can make driving a lot less pleasurable. "Contaminants can actually poison the fuel cell," explains sensor expert Professor Andreas Schütze from Saarland University. Even low levels of impurities can damage the fuel cell membranes. As a result, the fuel cell produces less electricity, power output is reduced and the vehicle travels shorter distances. In the worst case, the fuel cell will be irreversibly damaged and the car will simply stop running. Up until now, the purity of the hydrogen was determined by analysing samples in a laboratory. At Saarland University and at Zema—Center for Mechatronics and Automation Technology in Saarbrücken, researchers are working on a sensor system that continuously monitors the quality of the hydrogen during the refueling process. "The challenge is twofold: measuring at the required level of precision and coping with the conditions under which the sensor system needs to operate," says Schütze. The refuelling process uses hydrogen pressures of 700 to 900 bar and lasts less than three minutes. Andreas Schütze and his research team have already produced marketable measuring cells for monitoring the quality of oils and other liquids. But the pressures that the researchers are now having to deal with mean that they are in uncharted territory. "Up until now, no one has made measurements of this type at pressures this high. Normally, these sorts of measurements are done at pressures of no more than 40 or 50 bar," says Andreas Schütze. The measuring cell for the odourless gas H2 is installed inside the hydrogen fuelling station and the hydrogen fuel flows through a small tube. "We illuminate the gas passing through the tube with light from an infrared source and we collect the light passing out on the opposite side of the tube. If there has been a change in the chemical composition of the gas, the infrared spectrum will change accordingly. This allows us to detect the presence of unwanted additives or contaminants," explains Professor Schütze. Members of his research team are currently conducting experiments and are assigning particular infrared absorption signals to the various contaminants. They are also determining which wavelengths of the infrared spectrum are most suitable for the measurements and are calibrating the system. These important preparatory stages need to be completed before this autumn, when the sensor system will be installed in a hydrogen refuelling station for operational trials. "One of the questions we're studying at the moment is whether and how the intensity of the infrared spectrum we measure changes with pressure. 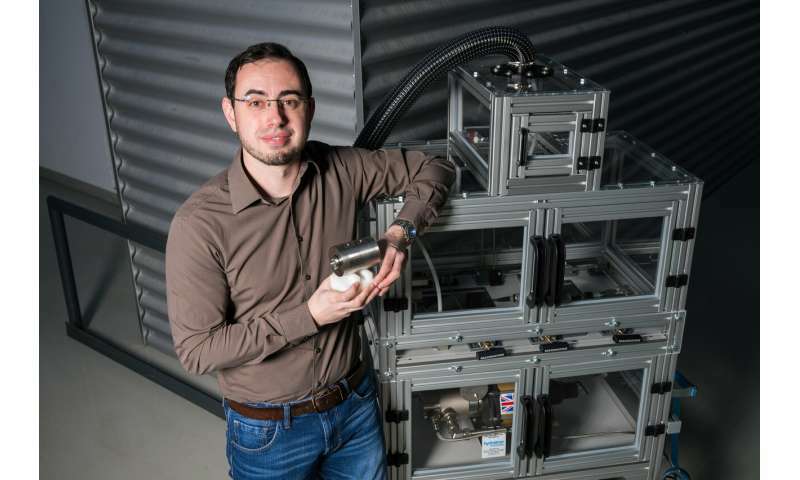 The sensor system has to be able to reliably detect a range of contaminants at concentration levels significantly below what we find in oils," explains Marco Schott, a doctoral student working on the hydrogen measuring cell.